This year was the first year I wasn’t home for Coachella or, properly, the Coachella Music Festival. Yet, though I was across the country from the event, it still felt more prominent than ever due to all the Snapchat stories, Facebook profile picture changes, daily (hourly) outfit updates on Instagram and so on. I felt like I was pretty much there, minus all of the inevitable sunburn. Nevertheless, I was sad to have missed it. I went last year for the first time and Coachella really does match all the hype it gets. But, little did I know that I’d have a blast, perhaps even more fun, during Boston’s Marathon Monday. This event occurs the day after the first weekend of Coachella, and conveniently falls on Patriots’ Day, a Massachusetts holiday, which means schools are canceled, stores are closed, and you get the gist. Party up. And the craziest thing is that although Marathon Monday and Coachella are vastly different, they have extreme similarities that I did not see coming my way. It made me love Marathon Monday even more than I would have — perhaps even more than Coachella. During Coachella — especially when you’re from Los Angeles — it seems like the millions of people from L.A. are there. 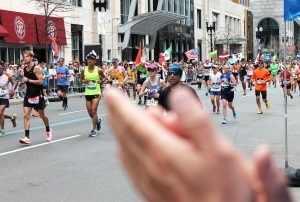 During the Boston Marathon, however, the whole day is truly about going out and celebrating the marathon runners. Ah, a crowd had never felt so comfortable. Though we didn’t have Coachella’s array of food tents back to back to back, we did have the city of Boston serving us whatever type food we desired — we just had to go into the restaurant and/or store and get it. I didn’t get a sliced of Instagram-worthy watermelon on a stick, but I did get a watermelon popsicle from CVS, and some boba and dumplings from the famous Dumpling Palace. Aw yeah. Everyone talks about Coachella. Everyone here talks about Marathon Monday. It’s a tradition. It’s a love of many. It’s the meaning of life. Yes, we party just like the Coachella goers do. In fact, we partied so hard, and so early, that music and food is put out for the public around 8 a.m. or 9 a.m. What is brunch? During Marathon Monday, you’ll see college kids roaming from house to house to house — essentially, party to party to party. Each house has a different vibe and different music playing, similar to the tents in Coachella. Coachella bathrooms are Porta Potties, unless you’re a VIP. Then, you pee in a trailer-truck. Whoop-de-doo. The party bathrooms are nothing better. Finding a toilet that has been previously flushed is a miracle during Marathon Monday. Fanny packs and bucket hats: in this aspect, Coachella and Marathon Monday are exactly the same.